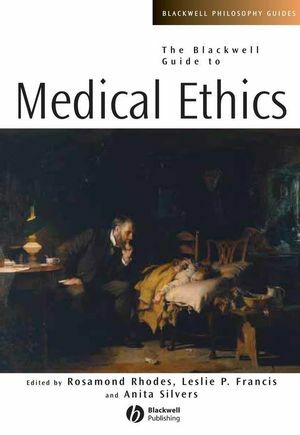 The Blackwell Guide to Medical Ethics is a guide to the complex literature written on the increasingly dense topic of ethics in relation to the new technologies of medicine. Organized with a coherent structure that differentiates between the decisions of individuals and those of social policy. Rosamond Rhodes is Professor of Medical Education and Director of Bioethics Education at Mount Sinai School of Medicine, and Professor of Philosophy at The Graduate School, CUNY. Leslie P. Francis is Professor of Philosophy and the Alfred C. Emery Professor of Law, Adjunct Professor of Political Science at the University of Utah, and Adjunct Professor in the Division of Medical Ethics, Department of Internal Medicine, University of Utah School of Medicine. Anita Silvers is Professor of Philosophy at San Francisco State University. Introduction: Rosamond Rhodes (Mount Sinai School of Medicine), Leslie P. Francis (University of Utah) and Anita Silvers (San Francisco State University). Part I: Individual Decisions About Clinical Issues. 1. Autonomy, the Good Life and Controversial Choices: Julian Savulescu (University of Oxford). 2. Individual Responsibility and Reproduction: Rachel A. Ankeny (University of Sydney). 3. Patient and Family Decisions about Life-Extension and Death: Felicia Nimue Ackerman (Brown University). I.2: Individual Decisions of Physicians and Other Health Care Professionals. 4. The Professional Responsibilities of Medicine: Rosamond Rhodes (Mount Sinai School of Medicine). 5. Truth telling: Roger Higgs (Emeritus, King’s College, London). 6. Medical Confidentiality: Kenneth Kipnis (University of Hawaii at Manoa). 7. Patient Competence and Surrogate Decision-Making: Dan W. Brock (Harvard Medical School). 8. Ending Life: F.M. Kamm (Harvard University). 9. Discrimination in Medical Practice: Justice and the Obligations of Health Care Providers to Disadvantaged Patients: Leslie P. Francis (University of Utah). 10. Institutional Practices, Ethics, and the Physician: Mary V. Rorty (Stanford University), Ann E. Mills (University of Virginia), and Patricia H. Werhane (DePaul University). Part II: Legislative and Judicial Decisions About Social Policy. 11. Reproductive Choice: Rebecca Bennett (University of Manchester) and John Harris (University of Manchester). 12. Public Policy and Ending Lives: Evert van Leeuwen (Vrije Universiteit Medisch Centrum), and Gerrit Kimsma (Vrije Universiteit Medisch Centrum). 13. Drug Legalization: Douglas N. Husak (Rutgers University). 14. Selling Organs, Gametes, and Surrogacy Services: Janet Radcliffe Richards (University College, London). 15. The Patient as Victim and Vector: The Challenge of Infectious Disease for Bioethics: Margaret P. Battin (University of Utah), Leslie P. Francis (University of Utah), Jay A. Jacobson (University of Utah), Charles B. Smith (Emeritus, University of Utah). 16. Uses of Science in Medical Ethics: Glenn McGee (Albany Medical College) and Dyrleif Bjarnadóttir. 17. Allocation of Scarce Resources: Paul Menzel (Pacific Lutheran University). 18. Just Caring: The Challenges of Priority-Setting in Public Health: Leonard M. Fleck (Michigan State University). 19. Justice and the Financing of Health Care: Stephen R. Latham (Quinnipiac University). 20. Judgment and Justice: Evaluating Health Care for Chronically Ill and Disabled Patients: Anita Silvers (San Francisco State University). 21. Justice in Research on Human Subjects: David R. Buchanan (National Cancer Institute, Bethesda), and Franklin G. Miller (National Institutes of Health, Bethesda). 22. Ethics of Disclosure Following a Medical Injury: Time for Reform? : Troyen Anthony Brennan (Emeritus, Harvard Medical School). 23. Pre-existing Conditions: Genetic Testing, Causation and the Justice of Medical Insurance: Robert T. Pennock (Michigan State University). Organized with a coherent structure that differentiates between the decisions of patients, professionals, and social policy.